Sesshin are intensive retreats for Zen Buddhist practice, during which silence and specific guidelines of procedure and decorum are maintained. The Living Dharma Center sesshin are for the LDC Sangha and Sensei Paul Gerstein must approve all applications. Generally, applicants should have at least several months of experience sitting with the LDC, or in rare cases with extensive Zen experience elsewhere, permission from Paul Gerstein after a meeting with him. Please send application (below), along with your check by the above deadline, to PO Box 1132, Easthampton, MA 01027. Alternatively, if your attendance is approved send an email to the address on the application form with the form included and bring your check to the sesshin. Location: We rent the Spirit Fire Meditative Retreat Center in Leyden, Massachusetts, just north of Greenfield, for our sesshin. The address is 407 West Leyden Road, Leyden, MA 01337. Locate it with ourdriving directions or Google maps. The files below are password protected. 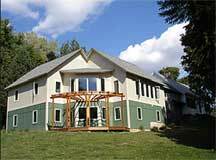 Students of the Living Dharma Center may request access by sending an email to password at livingdharmacenter dot org. Information About Applying to Sesshin: Read this page before filling out an application. Sesshin Application: This form is for printing and mailing. It is not set up for submission over the web. Sesshin Guidelines: All newcomers are asked to read this page. P.O. Box 1132 • Easthampton, Massachusetts 01027 • U.S.A.